View cart “Sharpie Schooner Building Plans” has been added to your cart. If you love those classic speed boats of old, then this display shelf is for you. Remarkably easy to make with our FULL SIZE patterns and straight forward construction. Requires two sheets of 1/4″ mahogany (or Luan) plywood for the top deck and sides, one sheet of 1/2″ plywood for the bottom, and 3/4″ stock for the transom and shelves. Cut the windshield from 1/4″ clear acrylic. Deck hardware and acrylic available separately. 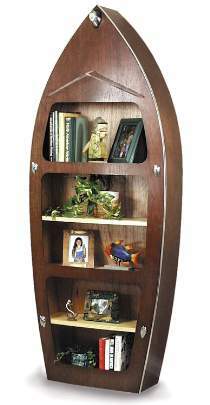 Measures 72″H x 28″W x 9″D.Speed Boat Bookshelf Hardware Parts Package Includes the chrome bow light, four chrome cleats and mounting screws, chrome side trim, and a sheet of acrylic to make the windshield. Project plan, wood and wood finish are not included. Stay InformedSubscribe to our email list so we can send you beautiful pictures of our latest projects. Subscribe to our email list so we can send you beautiful pictures of our latest projects.